this is a pikshur i drewd with my crayns of osuma bin aladdin. mommy then hunged it up on the refrijuratur. today im talkging to yu abut 911 wich happnd befor i was borned. daddy tolded mommy thatshe shouldnt be telling me this stuff rite now but mommy sed tat its ok. daddy then did wun of his big sihs and he he talkd to his imaginrey frend jesus agin. mommy got sum buks frum the libery and she lookd up sum stuff frum the inturnet. she fowund a website for kids and it hadded a funy dogy namd spot who taut me abut 911.
then mommy told me sum mor info and i new enuf to rite the articul. wut i no is 911 was a bad thing that was bad. so let me get startd. but first i have to hav my appl joos. ther wus a meen grop namd al cada hoo wus leded by osuma bin aladdin. osuma was a meany poopy head who dident lik the unitd stats uf amerka. so alcada pland a bad terist atack on the us. the plan wus to hijak a plan and driv it to the twin towurs which wer rely big. so they gotted a few pepels and they wer redy to do the atack. 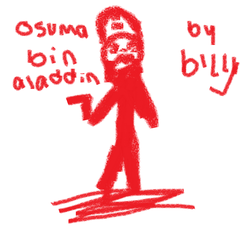 but befor the atack osuma bin aladdin did a lot uf meen vidyos for the us and they wer threts. but gorg dubyoo bush ignord osuma bin aladdin and he dident beleve him. peepul mad fun of al cada and they calld them meen nams lik the words momy dosent let me use. but sumtims i use them wen momys not loking! dont tattle on me. these ar the towurs that dyd. they went to heven, but uncle pete ses heven dusent exist. momy ses hes an athest and hes stupid. sum peepul wer on the planes and the terorists killd the pilits and they hijakd the plan. peepul scremed and the hijakurs laffed. the plan crashed into won of the twin towurs. peepul thot it wus un aksident. but it wasnt. the noos reportd it and peepul ran away. then anuther plan crashd and mor peepul died. then thowsunds of peepuls died and peepul cryd and it was sad.the terorists also crashed a plan into a big pentugon and anuther plan into the grownd. and osuma bin aladdin laffed and went to hide. then the firfiters cam to the rescyoo! but the bilding fel on them and they dyd. then ther wur sum tribyoots. i didnt no wut a tribyoot wus. so momy iksplaind to me tat its wen a bunch uf peepul sit arund and remembur peepul tat dyd. i askd if we haded a tribyoot 4 grampa wen he dyd. momy sed no becus tribyoots ar 4 speshul peepul. momy cals me speshul. maybee all get a tribyoot wen im big and wen i dyd. al the wurking peepul got tu go hom fur the res uv the dey. but noo yurk wus scurd. evryun thot tat osuma bin aladdin wus gowin tu do mor bad things! but he ran and hid for a loooooong tim and the presdunt gorg dubyoo bush blamd it on eerak. then ther wus a wor in eerak and sadam hoosan got blaymd and he wus killd. ten peepul wer poopies and tey wint 2 eerak and dyd. and wun uf my momys frends suns dyd in eerak but i wusent aliv ten so i wasent at the fyunurul. momy sed he wus a nys boy and he wus smart. but how cud sumwun be smart and be in the wor?? 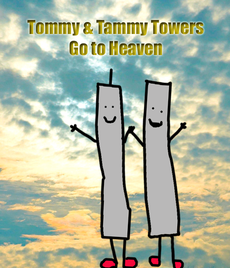 after 911 happnd peepul got scard that mor al cadas wer going 2 do it agin!!! so they put large xray thingys in the arport secyoroty areas and they can see inside yu. but now they wont let me take my snappl on the plane becus they think its a bomb so a month ago wen i went on vacashun i said its a snappl ar yu so stupid its not a bomb. then we had to stay in the arport offis and momy gav me my crayons and i drewd a skunk spraying a stinky and i then drewd the lady at the secyoroty area and i showd her and i herd her say to momy she dont like litle kids and they caus trubbl. and i hav to drink the airplan oranj joos and it tasts lik peepee!! then gorg dubyoo bush leevd and got replaced by bark obuma. obuma thin went tu pakastin and fownd osuma hiding in a big mashun. bark got a bunch of army guys and they killd bin aladdin. sumtims daddy ses bin aladdin went tu hel. but mommy ses hel is a bad bad word. so wer did he go? even tho i cant spal good enuf i no infurmashon abot 911 and mommy ses im smart and daddy also ses that but he also acts silly sumtims aftur he taks the tablts the man on the street gav him. o wel thanks fur listng tu my story. now ekscyoos me i hav to tak a poopoo. i hav to rembeber tu wip this tim!